Is cleaning out your email a Bloggiesta task? If most of the emails are blogging related, I would say yes! This is my number one goal. I need to do a mini-challenge contest post for my Stephen King Challenge. I wonder if I'll get around to finally listing my books read from the past two years here on the blog? Maybe this time. I'd like to work on my library blog, but this may have to wait until the full blown Bloggiesta in the Fall. Starting post for High Summer Read-a-Thon. 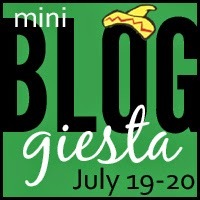 What are your Bloggiesta plans? Not signed up, you can do so here. Have fun and good luck with your list! I love this event...it gives me an excuse to do what I love: fiddle around with my blogs.